Creative Juice: NEW Eileen Hull eBook Just Published! Hello everyone! Eileen Hull has a new book out, Gifts to Die For, that is stuffed full of ideas that are perfect for this time of year! From holiday decor ideas to the perfect way to package, or make the gift itself, you will find plenty of inspiration complete with links to supply lists and tutorials. It's only $9.97 through the end of December. I am fortunate to have several projects in the book and I've done a little roundup here of a few of the Christmas decor ones (click on the images to go to the original posts). 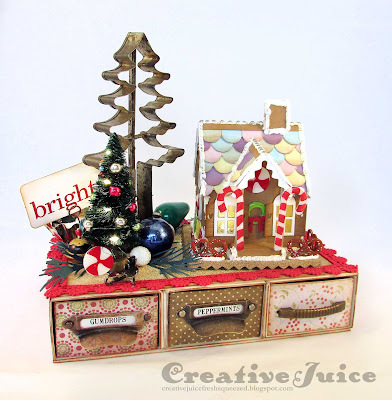 a gingerbread house built on a platform made from Eileen's Candy Drawer Die. A battery box for the mini lights incorporated into this decoration fits into one of the drawers! 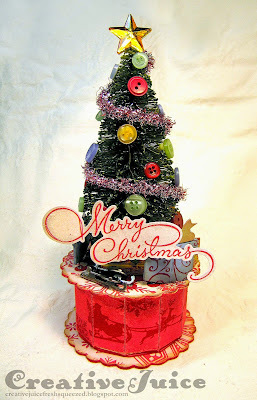 A christmas tree perched on a base made with Eileen's Cookie Box Die. The top is hinged and you can tuck a small gift inside. 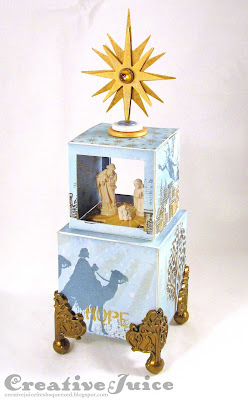 This ATB tower nativity scene is one of my favorite projects. It's made with the Block/Cube/Bank 3-D Die and Blocks/Cubes 3-D Die. It's a lovely reminder of what Christmas is all about. Thanks for stopping by and I hope you check out the book! Stay tuned next week and I'll have another roundup of projects that are featured in it. Have a great weekend!